Helen Abrahams, since 2008. Previously councillor for Dutton Park 2003-2008, councillor for Paddington 1991-1994. Inner south of Brisbane. 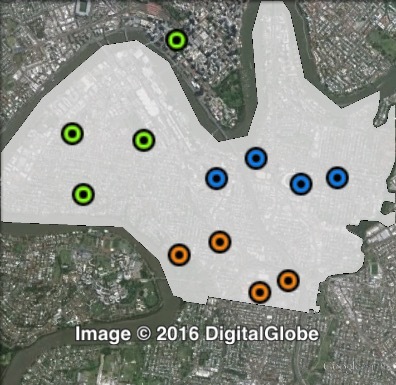 The Gabba covers the suburbs across the river from the Brisbane city centre, including East Brisbane, Dutton Park and West End. Map of the Gabba’s 2012 and 2016 boundaries. 2012 boundaries marked as red lines, 2016 boundaries marked as white area. Click to enlarge. 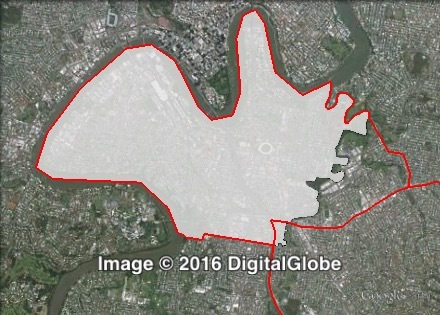 The Gabba lost Coorparoo to the new Coorparoo ward, and gained a small area from the old Holland Park ward. 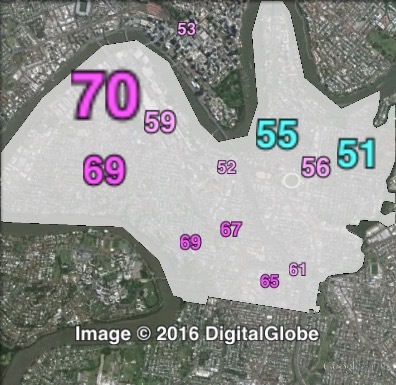 The Gabba replaced the Dutton Park ward, which covered the inner south and some nearby areas. Dutton Park was traditionally considered to be a safe Labor ward. Tim Quinn was first elected as a Labor councillor for the Gabba in 1985. He held the ward covering the area right up until 2003. Quinn served in civic cabinet throughout Jim Soorley’s mayoralty, serving as deputy mayor from 1997. Quinn was appointed as Lord Mayor to finish Soorley’s fourth mayoral term in 2003, and resigned from Dutton Park. Quinn was defeated by Campbell Newman in 2004. Helen Abrahams was appointed to finish Quinn’s term as Dutton Park councillor in 2003. Abrahams had previously served one term in Paddington from 1991 to 1994. Abrahams was re-elected in 2004 with a 9.1% margin over the Liberal Party, but the Greens polled 25.1% in their first contest in the area. Dutton Park was replaced by the Gabba in 2008, and Abrahams scraped by with a 2.7% margin. The Liberal Party outpolled Labor on primary votes, 37.1% to 35.8%, and Labor only won on Greens preferences. Abrahams was re-elected again in 2012. She increased her primary vote to 45% mostly at the expense of the Greens, and increased her margin to 8%. Sitting Labor councillor Helen Abrahams is not running for re-election. Labor shouldn’t have any trouble retaining the Gabba from the LNP, but the Gabba is the best ward for the Greens. Despite Greens ambitions to win this seat, their drop is still well below where it was in 2004 and 2008. The Greens will need a strong primary vote to be a threat, and are unlikely to seriously challenge Labor in 2016. Polling places in the Gabba at the 2012 Brisbane City Council election. North-East in blue, South-East in orange, West in green. Click to enlarge. Booths in the Gabba have been split into three parts: north-east, south-east and west. The ALP’s primary vote ranged from 40.7% in the north-east to 52.8% in the south-east. The Liberal National Party vote was almost 46% in the north-east, and less than 30% in the other parts. The Greens vote ranged from 13.3% in the north-east to 22.1% in the west. Two-party-preferred votes for councillor in the Gabba at the 2012 Brisbane City Council election. Greens primary votes for councillor in the Gabba at the 2012 Brisbane City Council election. no comments so why comment?